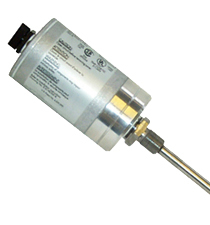 The Gemco 950IS Linear Displacement Transducer (LDT) is an intrinsically safe analog system. It uses a remote transmitter mounted in a safe area wired through intrinsically safe barriers to the LDT, which may be mounted in a hazardous area. The term 'Intrinsically Safe' pertains to a device's inability to produce an electrical spark of enough significance to cause ignition. This system incorporates circuitry that is U.L. listed for use in Class I, Groups C and D, Class II, Groups E, F and G, and Class III hazardous locations.